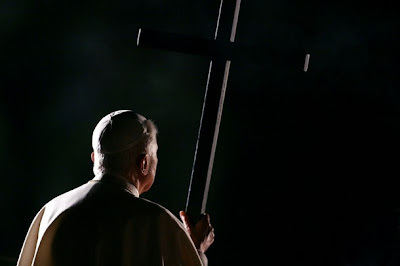 On Good Friday night, the Pope will continue the tradition of his predecessor and preside over the Via Crucis by torchlight in Rome's Colosseum. For the second year running, the meditations for the annual event -- a popular rite with the Easter tourists who flood the Urb -- come from the church in Asia; an Indian prelate, Archbishop Thomas Menamparampil of Guwahati, was tapped by the Pope to compose the reflections, during which the plain wooden cross will be borne around the ancient landmark by young people, prelates, families and, at the journey's close, Benedict himself. Like the Pope's top lieutenant, Cardinal Tarcisio Bertone, and last year's meditation-writer Cardinal Joseph Zen Ze-kiun of Hong Kong, Menamparampil is a Salesian of Don Bosco. Earlier this week, the Vatican's Office for Papal Liturgical Celebrations rolled out the English text of the 14 meditations, each accompanied by Indian art depicting Christ's passion and death in an inculturated context. In its introduction, the text presents itself as a "hymn of hope" amid the crises and struggles of the day. For Benedict & Co., the final run-up to Easter begins tomorrow morning with the Pope's celebration of the Chrism Mass in St Peter's Basilica. In keeping with tradition, the pontiff will move to his cathedral -- St John Lateran -- for the Evening Mass of the Lord's Supper. While the rubrics mandate silence at the end of the latter -- the opening liturgy of the Paschal Triduum -- pilgrims who've scored the coveted tickets in recent years have made it a point to loudly cheer and applaud B16 and present their children to him as the Pope departs the repository en route to the basilica's sacristy. Responding in kind, Papa Ratzi smiles, waves and blesses the babies.